Charles Mingus is one of the most important—and most mythologized—composers and performers in jazz history. Classically trained and of mixed race, he was an outspoken innovator as well as a bandleader, composer, producer, and record-label owner. His vivid autobiography, Beneath the Underdog, has done much to shape the image of Mingus as something of a wild man: idiosyncratic musical genius with a penchant for skirt-chasing and violent outbursts. But, as the autobiography reveals, he was also a hopeless romantic. After exploring the most important events in Mingus’s life, Krin Gabbard takes a careful look at Mingus as a writer as well as a composer and musician. He digs into how and why Mingus chose to do so much self-analysis, how he worked to craft his racial identity in a world that saw him simply as “black,” and how his mental and physical health problems shaped his career. Gabbard sets aside the myth-making and convincingly argues that Charles Mingus created a unique language of emotions—and not just in music. 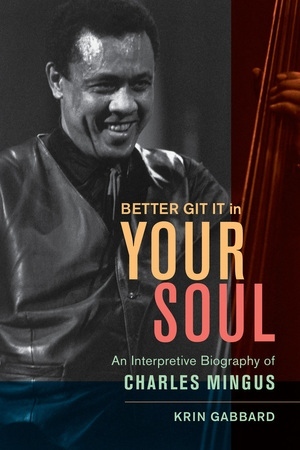 Capturing many essential moments in jazz history anew, Better Git It in Your Soul will fascinate anyone who cares about jazz, African American history, and the artist’s life. Krin Gabbard retired after thirty-three years of teaching at Stony Brook University, and he now teaches in the jazz studies program at Columbia University. His previous books include Hotter than That: The Trumpet, Jazz, and American Culture and Jammin’ at the Margins: Jazz and the American Cinema. He lives in New York City with his wife, Paula, and he is busy playing his trumpet and writing a memoir about his parents.